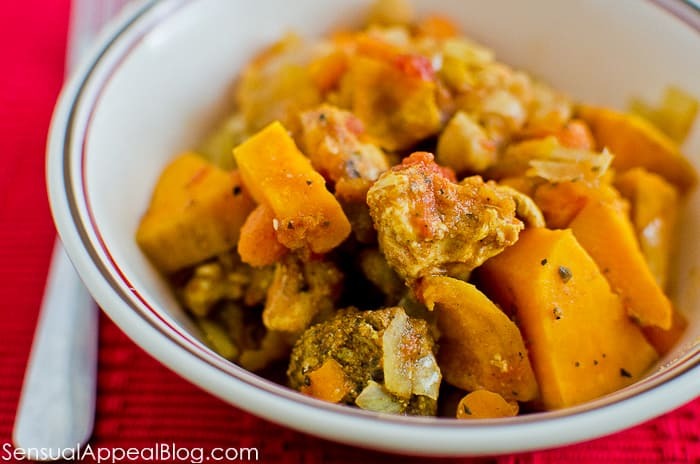 Last week I posted my first Crock Pot recipe – it was a Lightened Up Sweet & Spicy Veggie Curry which was also vegan! 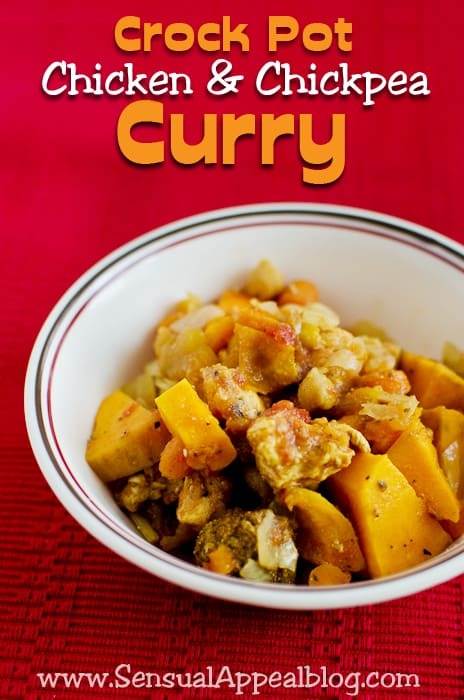 Today, I have another Crock Pot curry recipe to share with you, but this time it is not vegetarian because it features chicken. 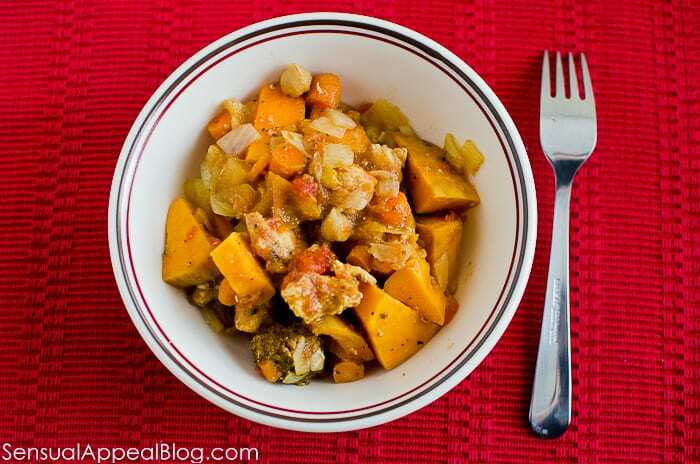 Say hello to a Crock Pot Chicken & Chickpea Curry! Okay I will warn you. I never make Chicken. Like ever. I never eat it. I’ve read some pretty terrible things about how commercial chicken farms grow them and it has scarred me for life. Then I learned that Chicken is not something I should be eating due to my blood type. So these two reasons combined lead me to never eat chicken. Lately though, I’ve decided to allow myself to eat chicken once in a blue mood – and only if it’s organic and free-range grown. So here’s that rare occurrence for you! A chicken recipe! I really like this recipe. The chicken was actually really delicious and moist and the spices made the flavor pop! 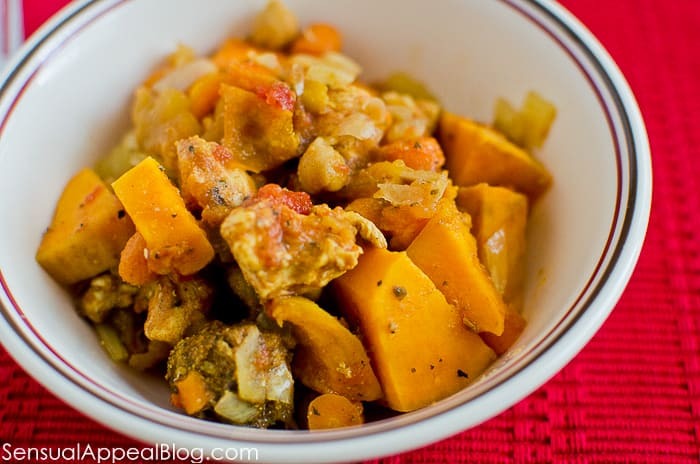 I loved the addition of sweet potatoes and there was just the right amount of kick from cayenne. Again, if you have curry paste – add 1-2 tsp to this. I didn’t have any curry paste so I amped up the curry powder but the curry flavor wasn’t that prevalent still. So I really encourage you to add curry paste to this if you have some! I bet it would be even more curry-like that way! 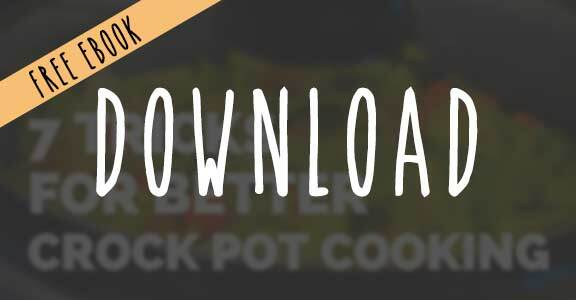 WANNA MAKE YOUR CROCK POT COOKING THE BEST EVER? Hope you have a great rest of your day! I should use my slow cooker more often. I eat chicken probably once a week to once a fortnight. I don’t yet own a crockpot but I really want to buy one for this winter especially when I see recipes like this one. You totally should, mine cost only like $30. It’s SO worth it! Well look at you, Miss Crock Pot Queen! Haha! Love it! And I love me some chicken!! I love slow cooker recipes! This one sounds sooooo good! I know how you feel; we use only free-range chicken in my house. This recipe looks beautiful. I really should use our crock pot more often.